These new findings, discussed in the January 5, 2007 issue of the journal Science, were a somewhat surprising revelation presented at the Fall Meeting of the American Geophysical Union (you can find the full article here). According to Arctic researcher James Overland of NOAA's Pacific Marine Environmental Laboratory (PMEL), Earth's recent warming "...has to have a natural component." By evaluating more than twenty different models after removing the human component of greenhouse warming, Overland's team found the same trend in increased Arctic temperatures during the 20th century that up to now has been solely attributed to human-induced causes. This warming trend resembled the fiercely debated hockey stick graph, which I discuss in chapter four of Is it Hot in Here?--The simple truth about global warming. But unlike the hockey stick graph, this upward swing in the NOAA findings was calculated without the human element--only natural variations were accounted for. These recent findings will no doubt be viewed by climate change contrarians as ammo to shoot down the idea of human-induced global warming. In many respects, these skeptics would be correct, but only if arguing over the typical either-or, polarized perspective. As the NOAA team points out though, a human element is still somewhat evident. In fact, despite a steady increase in temperatures from natural causes over the past 100 years, all of the models showed a substantial warming near the very end of the 20th century. This, they believe, is the human-induced greenhouse effect kicking in. Nevertheless, Overland points out that, "the air temperature and loss of sea ice [in the Arctic] is occurring faster than global climate models would predict." Thus, his NOAA team concludes that their recent findings reveal a strong natural warming riding on top of long-term human-induced change. On this basis, the anomalous warming and accelerated ice-loss over the past ten years are not to be blamed on humankind alone; instead, this would be a consequence of combined natural and human-made warming, with the natural element being rather significant. The recent study conducted by Overland's NOAA team has perplexing results. This team of expert scientists though is not the first to report on nature being a powerful yet rather mysterious component to our warming world--something omitted from most media accounts and many highly publicized compendiums on climate change. In fact, even NASA pointed out a few years ago that no one really knows how much of Earth's warming is just from natural causes, such as the flux of warm water into the North Atlantic from the 1990-1996 positive phase of the North Atlantic Oscillation, or a response to the long-term warming of the planet since the transition from the last glacial period that ended about 10,000 years ago. No one is just quite sure, yet the natural element is oftentimes left unmentioned. Others have taken the natural warming stance in the past, including one OSU researcher calling for an end to our recent warming trend in a couple decades (which you can find here), a similar view shared by other skeptics like Richard Linzen of MIT and Sallie Baliunas from the Harvard-Smithsonian Center for Astrophysics, among others. Being contrary to scientific consensus and going against the grain of media and political accord, such views purporting natural variation as a cause (although not always the cause) of global warming are often perceived as heresy, with a "burn the witches at the stake" mentality. The recent findings by NOAA's PMEL team though resonate with credibility, which you'd think would make it newsworthy. Well, don't hold your breath. Despite the fact that this report came from the prominent National Oceanic and Atmospheric Administration (NOAA), was published in the prestigious journal Science, and presented to the well-regarded American Geophysical Union, it just doesn't have the shock and awe, sky is falling, cataclysmic, ratings-escalating appeal that most news agencies are looking for these days. In fact, doing a Google News search using the key words "NOAA Overland Arctic" as well as "NOAA PMEL Arctic" revealed zero results relating to this story. In any case, what we do know is that there is still a lot we don't know. We don't know why Artic and Greenland ice is melting faster than any models can predict, we don't know why sea levels have barely budged despite recent extensive ice-loss, we don't know why sea surface temperatures cooled recently, and we don't know exactly why 2006 had such a quiet hurricane season when the sky-is-falling camp cried there would be (more on that here). Yet should we wait for all the questions to be answered before taking steps to reduce our carbon emissions? Should we use doubt as an excuse to maintain our dependence on the burning of fossil fuels? Some things are out of our control, including the predestined fluctuations of Mother Nature's climatic moods. Yet there are things that are well within our capacity to manage, things that can avoid worsening an already risky issue. Human emissions of greenhouse gases, compounded by our dangerous dependency on foreign oil from Middle Eastern countries and anti-American antagonists like Venezuela's Chavez, the pollution created by burning fossil fuels, and natural disasters caused by oil production and transport should be reason enough to work towards a greener future. 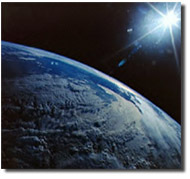 And with evidence still pointing toward a human-induced element within natural climate change, it stands to reason that we should take steps to protect the only planet we have at our disposal, while at the same time planning mitigation options to deal with changes that, through human and natural causes, will unavoidably occur. To stay abreast on similar articles like this, you can signup for the free GreenhouseTruth newsletter. Additional information on historic climate events, global temperatures, sea ice extent, skeptics and other topics discussed in this blog can be found in Nathan Cool's new book, Is it Hot in Here?--The simple truth about global warming. Click here to get your copy.